is there a charger that can put a li-ion battery in ‘storage mode’? what i mean is, charge it up to 40-50% capacity and then stop? SkyRC mc3000 can be programmed to terminate at desired voltage level, I believe. Opus BT-3100 has has an internal switch to charge to 3.7 volts. Just have to remove a bit of plastic to make the switch accessible. on CPF member “realista” published a picture of this switch. I hope he does not mind me posting it here. Standard voltage of the BT-C3100 is 4.2V but can be altered in 4.35V or 3.7V (for charging LifePo4 batteries?). 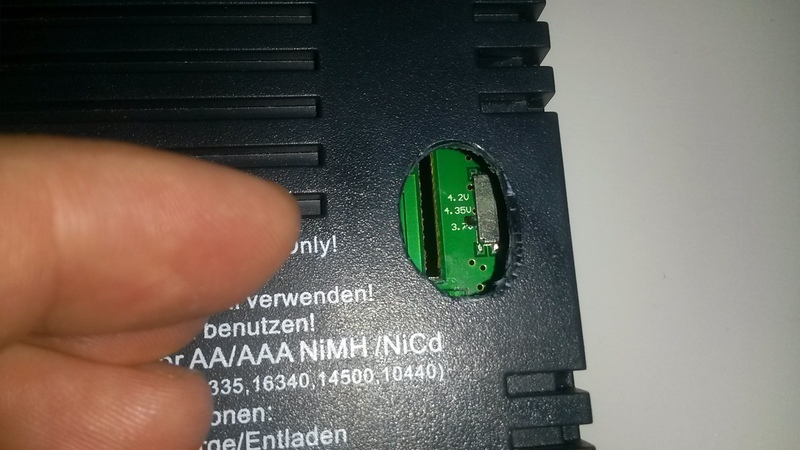 There is a switch on the “motherboard”, but to get there you have to open up the charger from the underside. “realista” shows us he has overcome this nuisance by making a hole in the underside of the charger. HKJ has mentioned the presence of the switch in his review, but he wrote he did not look into it any further.